A late charge from Jens Dantorp saw the Swede leap ahead of a crowded leaderboard to take a one-shot lead into Sunday's final round of the Aberdeen Standard Investments Scottish Open, the fifth Rolex Series event of the 2018 season. As a thrilling day of action drew to a close at a blustery Gullane Golf Club, East Lothian, Dantorp was in a seven-way tie for the lead before three birdies in his final three holes took him to 13 under par and one shot clear of 2015 champion Rickie Fowler of the United States, New Zealand’s Ryan Fox, Australian Scott Hend, Englishman Matt Fitzpatrick, Marcel Siem of Germany and another Swede in Alexander Björk. 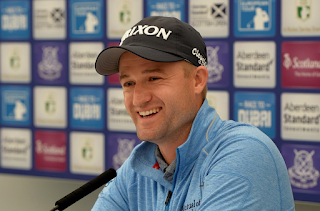 While Dantorp chases his first European Tour win, Russell Knox (pictured) kept hopes of a homegrown victory alive with a round of 66 to get to 11 under par alongside English pair Aaron Rai and Tyrrell Hatton. Another seven players, including 2008 Masters Tournament champion Trevor Immelman and fellow Major winner Justin Rose are one shot further back, while eight further players including American pair Charley Hoffman and Luke List are nine under par going into the final day on Scotland’s Golf Coast. Rickie Fowler: “It was definitely nice to come back on the back nine and get ourselves in a good spot for tomorrow. Made a few mistakes and some missed judgments early in the round. Came back nicely and felt like we made some good swings out there and a couple nice putts. Definitely a good spot and ready to go have some fun tomorrow. Ryan Fox: “I’m very happy. Played decent the first couple rounds. Didn't get much going, energy levels probably down from last week, which is understandable. Got a good night's sleep last night and to be fair, today looked nothing different than the first couple days. Just played the back nine a little better than I had done. Alexander Björk: “The entire course played totally different than it did yesterday. Yesterday was pretty much no wind, so played really easy. Today with the opposite wind, it played really tough. So it was a totally different course and it was fun to actually play it. I think this is the way it's normally played, what I've heard. It was nice. You want to be in the position I am and you want to be close to the lead or in the lead. You want to be in the mix and that's where I am now, so I look forward to tomorrow and hopefully I can be up there.